Golden Euro Casino offers a big catalogue of games. In fact, the players can access over 150 games on the site! At the top of the main page, the player can choose between instant play games and download-based titles. The casino is also mobile-ready, which makes it an ideal companion for users of mobile devices. The main website does not stand out in terms of graphics. However, the simple web design may even be an advantage. After all, the players love websites that are known for easy navigation. The promotions page is very pleasing to the eye. This isn't just the result of a nice page layout. A wide variety of promotional deals are presented on the page! A €1000 package is available for all first-time visitors. Specific coupon codes are provided in the promotions section. The deals that constitute the package appear in a certain order. 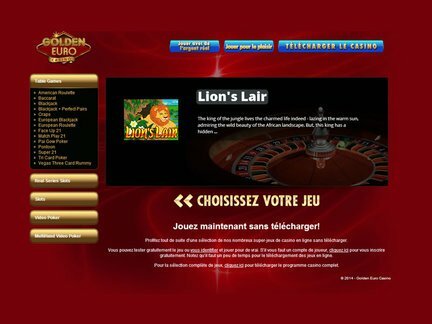 For example, a 100% up to €100 Golden Euro Casino Bonus deal can be accessed by typing the following words; GOLDENWELCOME. At the start of each month, Cthe casino provides a €200 monthly gold bonus (Coupon Code: MONTHLY). A 25% cashback deal is another nice feature here. Essentially, the player can claim a 25% cashback on every deposit hat is made without a deposit bonus! Furthermore, the website offers two €100 deposit bonuses as part of the weekend bonus package. There is a wide variety of payment methods that can be utilized at the casino. The options would include; Wire Transfer, Visa, MasterCard, American Express, Neteller, Eco Card, Skrill and PaySafeCard. The players can have a peace of mind when engaging in any financial transactions. The site offers top-notch security and encryption. The name of the casino makes it clear that the website is focused on the European online casino market. The players are drawn mostly from the continent. The support that is given to the € currency is a sign of the casino's commitment to players from the region. If a player resides in jurisdiction which prohibits online gaming, the casino will refuse to set up an account. However, the precise list of countries with the aforementioned restrictions isn't provided by the staff. Golden Euro Casino can be categorized in the following manner; Progressives, Slots, Specialty Games, Table Games, Video Poker and Mobile Games. The highlighted games would include; Santa Strikes Back, Dream Run, Ocean Oddities, T-Rex, Stairway to Heaven, Caesar's Empire, Hillbillies Cashola, Ninja Star, Regal Riches, Hen House, Lucky 8s, Lucha Libre, Naughty or Nice, Cleopatra's Gold, etc. The progressive game category only features two games, mainly Spirit of the Inca and Megasaur. The players will likely be interested in the mobile games on the site. It is worth mentioning that the casino carries the following titles; High Fashion, Goldbeard, Enchanted Garden, Coyote Cash, Count Spectacular, Builder Beaver and Blackjack 21. An above average score from players means that the casino is managing to hold the player's attention. However, the casino has received complaints from players, primarily having to do with the account verification process. Those complaints are now resolved. The casino runs its own blog. It also allows players to speak with the staff. Live help is the best method of contact. However, it is also possible to send an inquiry via e-mail. The website was established in 2012. It has achieved a license from Curacao eGaming. This type of a license is not going to be a guarantee of the casino's integrity, as it is a business-only license. At the same time, the casino is operating legally. The license can serve as proof of the establishment's legality. I was flipping through the mobile game section and having a hard time deciding which game to choose. Honestly, I was surprised by how many good games I could find in a single spot. Additionally, I was surprised by the quality of the promotions on the website. In my opinion, the website can be a great source of entertainment.